While we in the U.S. continue to talk ourselves deeper into paralysis in our national argument about taxation, our neighbors to the north are making the strategic investments necessary to keep Canadian rail competitive with the exciting new standards being set by railroads in Europe and Asia. So as we turn up the volume on our favorite political cable networks, Canada, led by its government, is laying the tracks for the 21st century. With its broad, spanning landscapes and its vast distances, Canada is ideal for rail, especially if you are riding behind the large windows in VIA Rail Canada’s (VRC) Prestige Class that give you Canada in CinemaScope. For Canadians, rail is as much a medium for touring as it is for business travel, and so the investments have helped Canadians pursue both pleasure and commerce. The drum beat of improvements in the rolling stock has been steady since 2007, when the Canadian government began a $1 billion in investment into the actual rail product, not counting stations. Last year, CNN’s foodie traveler Anthony Bourdain included VRC in his “Parts Unknown” series in the episode on Canada. While he used the train to accentuate the role rail played as a unifying ingredient in Canada’s history, he also went to some lengths to celebrate the amenities of VRC’s Prestige class amenities and that was before the new improvements. This month, the latest car product improvement comes as VIA Rail Canada (VRC) (www.viarail.ca) completes its refurbishment of all 26 of its new Business Class Cars. The changes include more spacious cars, improved lounges, upgrades in environmental sustainability, new meals and more personalized service. The rollout is just part of a larger upgrade of VIA Rail Canada’s business-class service, which is itself just part of an even larger investment by the Canadian government in its national rail passenger service. 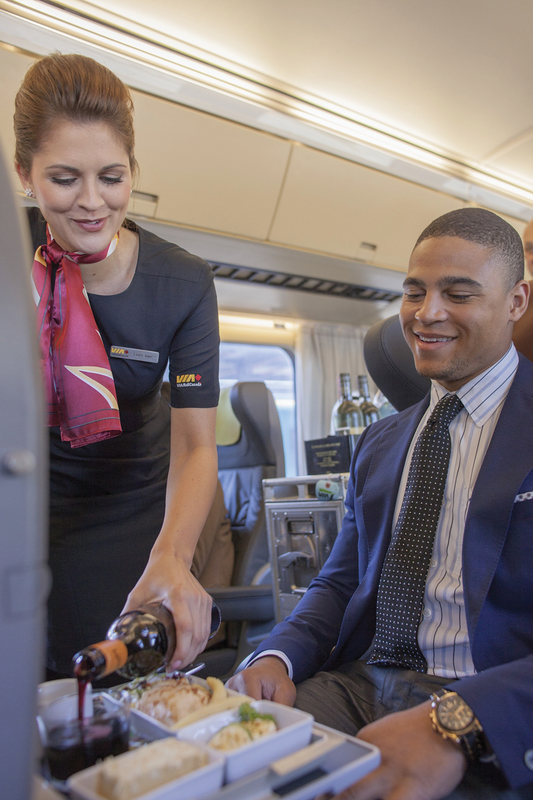 PHOTO: Wine is served with meals in VIA Rail Canada’s new Business Class. Highlights of the new Prestige Class include a dedicated concierge; cabins that are 50 percent larger than the previous cabin for two in Sleeper Plus class; windows that are 60 percent larger than the window in the Sleeper Plus cabin for two; private washrooms with showers; a flat-screen television with a video selection; a minibar stocked with a selection of beverages as well as new and renovated cars, including Dining, Manor, Château, Park, Skyline and Economy; and the recently inaugurated Business Class cars used on the Corridor route between Québec City and Windsor. VRC now has priority ticketing and check-in lines for Business class and top-tier members of its loyalty program, VIA Préférence. Once onboard, Prestige class travelers are served with hot towels, beverages and snacks as well as a full bar service (included). The top VIA Préférence Premier members will receive additional recognition such as priority meal orders. All three meals in Business class have been improved with small touches such as hot bread. During both lunch and dinner, passengers can choose from a selection of gourmet cold or warm meals and a glass of wine. All beverages are included in Business class. Free Wi-Fi access is available on all trains in the Québec City-Windsor corridor and every seat has its own electrical outlet. New ergonomic seats have a “slim-line, sports-car feel” with lumbar support designed for long trips. The new Business seat design opens the sight lines to the windows, making the cars brighter and more spacious. The renovated cars offer passengers more space and additional leg-room, thanks to the new two-by-one seat configuration, which has one less seat per row. In 2011, VIA Rail unveiled more fleet improvements under the auspices of the Canadian Government’s Economic Action Plan. VRC refurbished its stainless-steel sleeping, dining and dome cars and they upgraded the Renaissance fleet, the Light Rapid Comfortable (LRC) coaches on the Corridor route and overhauled their locomotives. They also spent $98 million to overhaul the passenger coaches used on the Ontario-Quebec corridor routes, with reupholstered leather seats in business class cars, improved restrooms and other enhancements. Another $5.8 million was spent on renovating 21 Renaissance coaches used on routes between Quebec and Toronto and Montreal and Halifax, including improvements to economy class and sleeping cars on the overnight Ocean service. PHOTO: Relaxing in VIA Rail Canada’s new Business Class. Support infrastructure is also being improved. All seven Business lounges on the Québec City-Windsor corridor (Toronto, Ottawa, Montréal, London, Dorval, Québec City and Kingston) have been completely refurbished. Toronto’s Union Station alone, received some $1.2 billion in refurbishment. In August, VRC unveiled a new car that was designed for people with disabilities. In total, four Park cars used on the Canadian will be reconfigured to include a fully accessible cabin. The Canadian operates between Toronto and Vancouver. “From Halifax to Vancouver, VIA Rail is able to accommodate persons with disabilities on board all its trains,” said Yves Desjardins-Siciliano, president and CEO of VRC. The drive for accessibility has been ongoing these last few years as VIA Rail has improved accessibility in its stations and on its rolling stock. In recent years, VRC has been working intimately with U.S. wholesalers in the hopes that it can reach the high quality kind of traveler that pursues the more exotic long-haul destinations. As is often the case, Canadian tourism suffers in the U.S. because so many of us think we know the country and the truth is we don’t. Canada is an amazing natural destination that is dotted with cities that pack a diverse cultural punch. Consider VRC’s most popular route, the four-night journey between Vancouver and Toronto that explores breadth of the Canadian West. On the Pacific Coast Route, VRC explores the Skeena, a region rich in waterfalls, mountains and coastal landscapes, from Alberta’s Jasper National Park to Prince Rupert on the Pacific Coast of British Columbia. To highlight all of that VRC unveiled a new Panorama viewing car, enhanced by superior meal services. 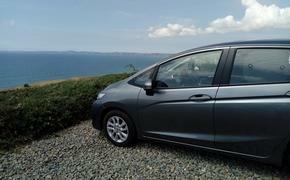 The Panorama car, available in Touring Class, has extra-large dome windows for mountain viewing and 71 reclining seats. The at-seat service features hot and cold selections for breakfast, lunch and dinner with wine and more. The proximity of Canada’s best experiences makes it ideal for even the worldliest American traveler who may be tired of all that long-haul flying to arrive somewhere interesting. Though Americans think they know Canada, it remains an undiscovered destination by and large, and VRC spans it with VIA Rail operating intercity, regional and transcontinental trains linking 450 communities across its network of nearly 8,000 miles of track. A version of this article appears in print in the October 2014 issue of Vacation Agent Magazine.